Ereaders are still at the point where the price is slightly too high and the functionality is slightly too low to purchase on a whim. Aluratek's LCD-based reader, however, offers a damn low price but sacrifices functionality in return. Relatively cheap, compared to the major ereader brands, but it's probably the worst ebook reader we've tested. 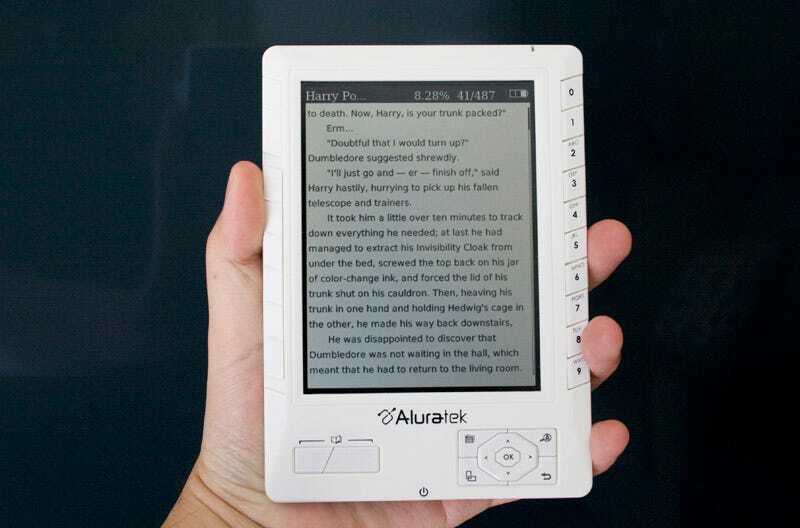 Instead of going for an e-ink screen like the Kindle or the Nook, Aluratek went with a monochrome LCD screen. This is fine, in theory, because it keeps costs low and actually improves refresh rates, it also sacrifices battery life. For example, I could only make it through 80% of the 7th Harry Potter book before it demanded to be charged. You're looking at a day or two's worth of reading at best, and by that I mean reading on and off and not for 24 hours straight. Performance is pretty horrible as well. Aluratek seems to have only put in a processor strong enough to turn the pages at a decent speed, because startup times, navigation and book loading times were atrociously bad. Granted, this won't be an issue when you're actually reading books, which is most of the time. The worst thing about the reader is probably the button placement. There are three ways you can turn a page: using the page turn buttons on the bottom left, the arrow keys on the bottom right or the page toggle on the left edge of the screen. They're all pretty clumsy. The bottom left and bottom right methods are too far down the reader for you to hold your hand in that position while you're reading, so you'll have to move it down every time you want to advance. As for the left hand slider toggle, those traction edges that they placed in there to make it easier to grip and scroll is actually too rough for my delicate hands, so I avoided using it when possible. Basically, they've got an ebook reader that's difficult to turn the pages with.